Greek White Bean Soup (fasolada): Lemon or tomato? Which legume is so good to be honored as “National Food”? So important that a myth is associated with it? A legume that saved thousands from starvation during the hardest historic periods? Affordable, filling, super comforting, easy to cook, highly nutritious (high-fiber, low-fat source of folate, iron) and an excellent source of non-animal protein? Right! 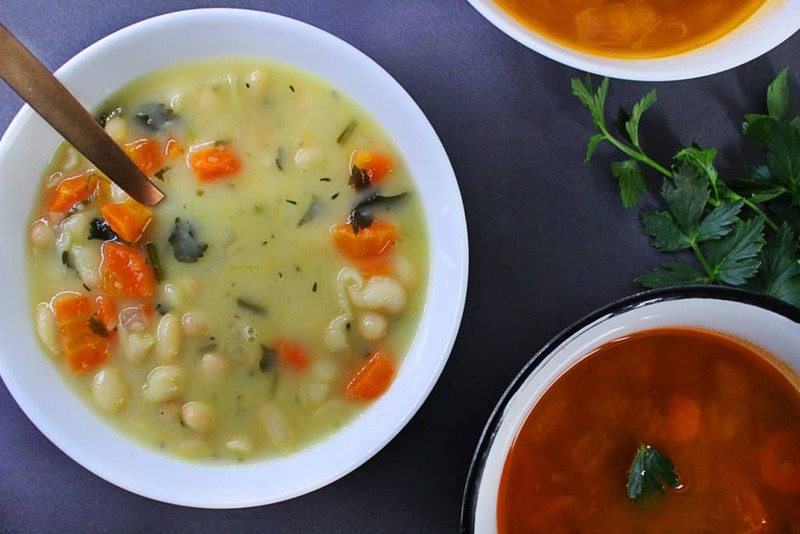 Beans, in particular, a hearty, rich white bean soup (or stew) called fasolada (or fasoulada or fassoulatha or fasolia). 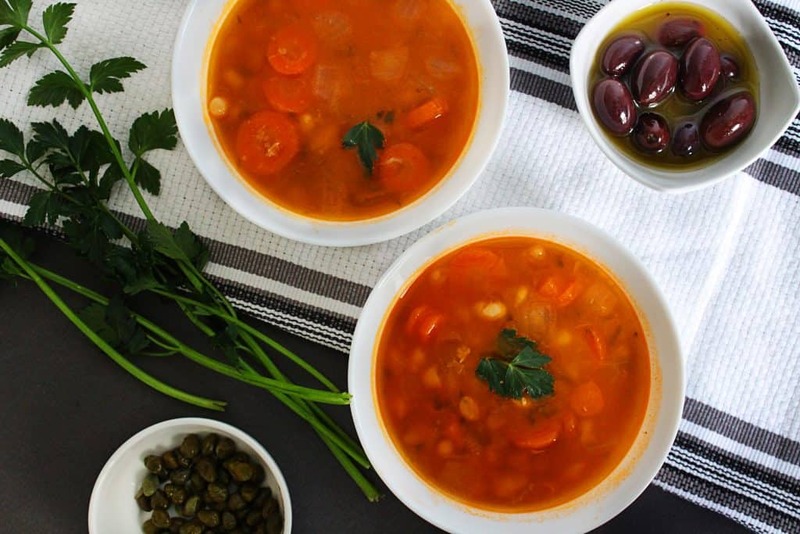 Eating fasolada is written in the Greek DNA. 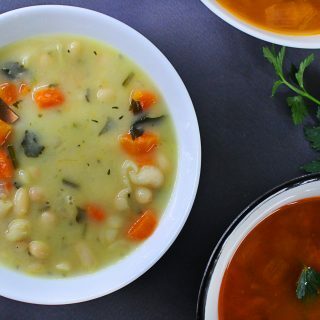 Ancient Greeks offered those beans as a sacrifice to Greek god Apollo at the Pyanopsia festival, a whole day dedicating to white bean soup. 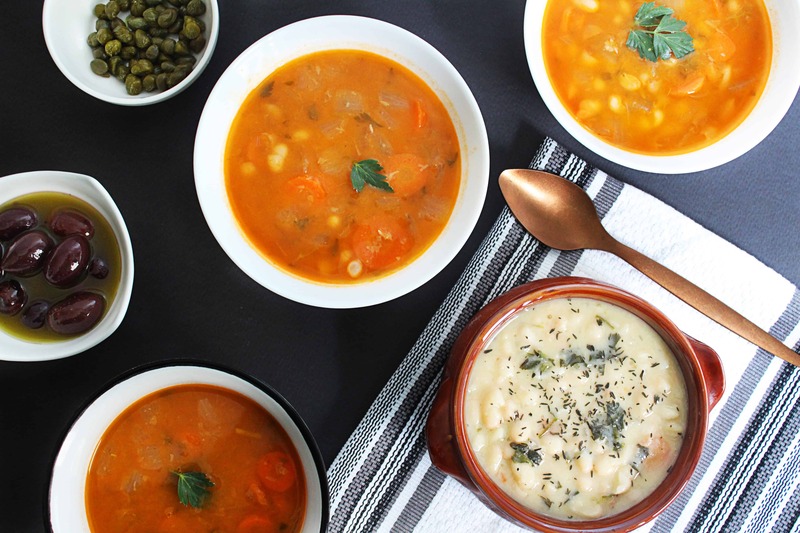 According to the myth, it was first Theseus, the legendary King of Athens, who offered a kind of white bean soup to Apollo. He visited Delos, the sacred island of Apollo, in order to thank him for killing Minotaur, a lethal beast at the island of Crete. But a seven day trip from Crete to Delos left Theseus without supplies and therefore he had to improvise and find something nice to offer to the god. After all, ancient Greek gods were so demanding and hard to please. He gathered everything he could find on the island and made a soup from the seeds of a plant. Boom!!! The first white bean soup was born. Ever since beans are a staple along with all kind of legumes and feed the nation throughout difficult times. My grandmother’s vegetable garden saved my family from starvation during World War II and fasolada (beans and other legumes like lentils, chickpeas) was a valuable source of protein for years. Nowadays, beans used to be hugely underrated and fasolada was once considered “poor man’s” food but they got the respect they deserve after the economic crisis. 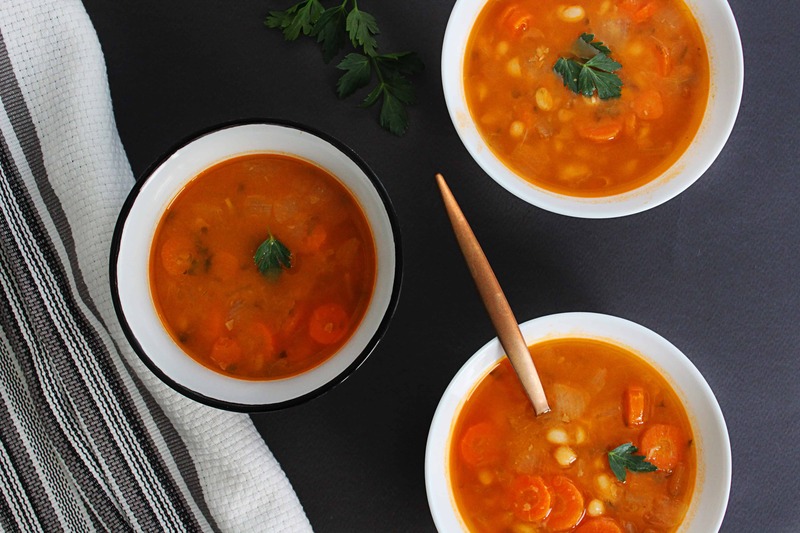 Fasolada is nothing more than white beans stew with veggies like onion, celery, and carrot. The end. Actually, there are two kinds. The white version with lemon and the red one with tomato paste. Both of them are equally delicious and so similar to cook that it is usually a last minute decision whether my family’s fasolada will be white or red. For this post, I was facing the same dilemma: white or red? Lemon or tomato? Ah, what the heck, I’ll post both of them. There you go. Problem solved and excited by this challenge, let’s cook! To begin with, fasolada calls for good quality dried beans. I am sorry to disappoint those who prefer the convenience of canned beans but I have to be honest and tell you that you will get neither the perfect flavor nor the desired texture from canned beans. The taste is totally bland and the texture more or less mushy. On the other hand, dried beans need soaking and more cooking time which is totally worth the trouble because that’s how they take on flavor as they cook. 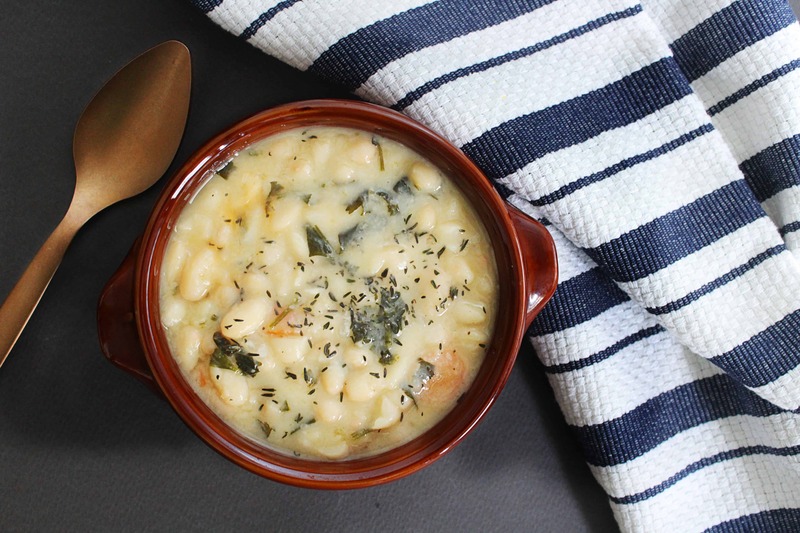 The traditional recipe asks for cannellini or navy beans but any medium-sized dried white bean is good to go. Try to find good quality bulk beans and ask for as fresh as possible. 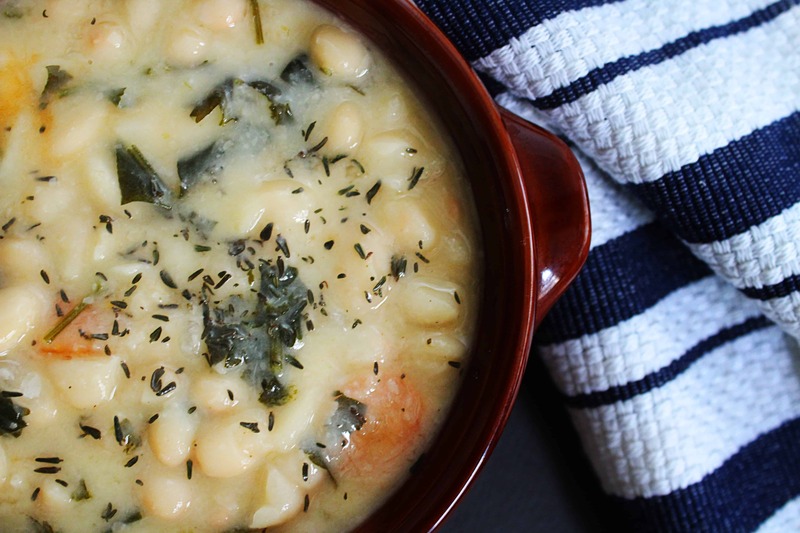 The secret behind the perfect white bean soup is new crop beans. They have this wonderful light flavor, cook up faster and give the perfect texture which is something between soup and stew. I will explain. Fasolada is served as main dish and it is thick enough not to be a soup but it’s still liquid enough not to be a typical stew dish. Crazy, isn’t it? Discard any foreign objects (leaves, small stones, broken beans) and give the beans a quick rinse with cool water. Soaking at least 8-12 hours at room temperature in three times their volume of water is necessary in order to make them more digestible and enhance their nutritional benefits. Additionally, you may boil them for 2-3 minutes, drain and discard the water. Soaking and fast boiling will increase digestibility, reduce phytic acid effects and prepare the legume to give their best flavor. Start the cooking procedure with hot water this time because cold water over hot beans will instantly make them hard. Not good. I avoid sautéing whenever is possible. I save at least 10 minutes which is certainly a bonus without compromising on flavor. Gentle simmer will prevent split skins and gradually enhance creamy texture and desired flavor. No need to rush here. Add the veggies and let it simmer. Most of the time is passive time. Stir occasionally throughout the cooking process to prevent sticking and if you need more water, it should be hot. Salt and acidic ingredients like lemon and tomato should be added when beans are fully cooked. Otherwise, they prevent the beans from becoming tender resulting in more cooking time. Extra virgin olive oil is the last addition when we remove the pot from the heat. That’s how we keep all its magic components intact and ready to south our body and soul. Not to mention that this cooking technique provides extra glorious thick and creamy texture. White with lemon or red with tomato? You are going to love both of them. Let’s say that your taste buds scream for lemony flavor for dinner. While cooking your kid disagrees with you because “I really want to eat tomato today momyyyyyy”. Breathe in, breathe out. Take out tomato paste (or passata) from the pantry and simply add some into the pot. Everything is under control. Dinner is saved. Both recipes follow the same steps right from the beginning and the major difference is the addition of tomato paste (or passata). Traditionally the white version calls for lemon juice served on the plate seconds before enjoying it. 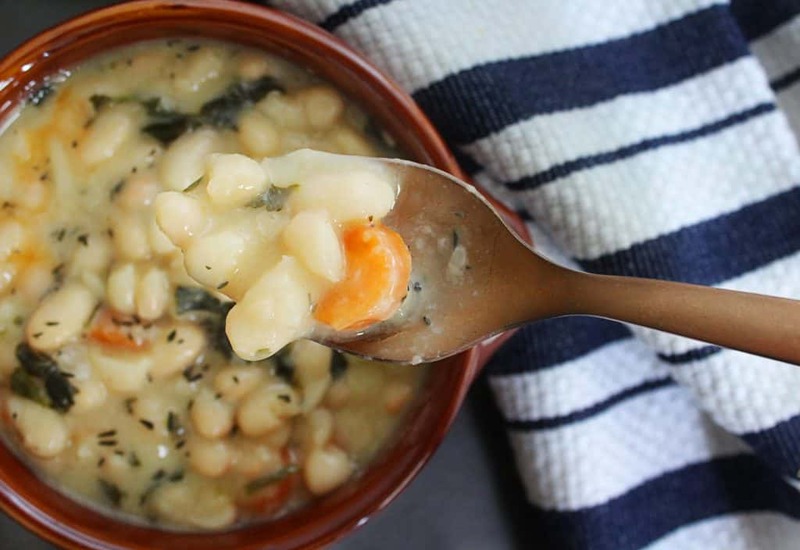 Tip for the creamiest white bean soup ever! Blend a cup of already cooked soup in food processor or blender and add the mixture to the pot. Perfection! It is rather difficult to find this dish in a restaurant but it is a staple in every Greek home that follows the Mediterranean eating patterns. Legumes are served at least 2 times per week usually served with crusty whole wheat bread, fermented vegetables like carrots, peppers etc, salads with vinegar like Greek cabbage salad, salty fish like smoked herring and anchovies and definitely Kalamata olives. Rinse soaked beans and boil them for 2-3 minutes. Drain and discard the water. Clean the pot, add beans and hot water. Add onion, carrot, celery, garlic (optional), bring to a boil and reduce heat to medium-low. Cover and simmer for 1 – 1 ½ hours until soften but not mushy. Add water if necessary. Add salt and pepper. In a blender or food processor, blend one cup of soup. Add the mixture in the soup and simmer for another 10 minutes. Stir well and remove from heat. Add olive oil. Serve with the desired amount of lemon juice and red pepper flakes (optional). Follow the same instructions and add only 1 dried bay leaf and 1 teaspoon rosemary along with vegetables (see above instruction #2). Finally, add 2 tablespoons tomato paste (or ½ cup passata) along with salt and pepper (see above instruction #3).